The meeting was broadcast on "Cablevision-Optimum" Channel 15 and "Verizon FIOS" Channel 37. However, the sound was low on Cablevision-Optimum. An audio level booster was purchased and installed. The problem now appears fixed. There was a 45 minute discussion between a "Developer" "Raritan Orlando Drive Associates" and the Council. That location currently has a badly damaged building that was once operated by "United Dyes". The new plans for that property call for 44 apartments to be built. These apartments will be on the second and third floors of the buildings, which will be 44 feet high. There will be 2,800 square feet of retail space along Orlando Drive. The main issue discussed was when would the existing damaged building be demolished. The town wants the Developer to demolish the building right away. It is a major eyesore that has sat for a year since the fire destroyed the inside in May of 2015. Approximately 8000 cars drive by it a day. The Developer does not want to demolish it right away. he spends approximately $90,000 to knock down the building. Developer thinks all approvals can be granted in 6 - 9 months. to the river could be jeopardized if he demolished the building before he gets approval. The developer feels his "grandfather clause" rights will be extinguished if the building is knocked down first. Thus if the building is demolished his approval may not go through. was not the determining factor but the footprint of the building, thus the building could be knocked down right away. More information would be gathered about all of this. The town and the Developer will have a public hearing again on this issue at the next meeting on May 10th. (paraphrased) What happens if the approvals needed to build do not go through? Would you still demolish the building?" The Developers answers included "I guess we will demolish it", "Nobody knows - cannot predict the future"
"I think it will be demolished" and "would have to look at options - may or may not". Thus the developer was not guaranteeing that the building would be demolished it the approvals do not go through . Years ago the town was given Grant Money for "historical preservation/repair/code upgrades"
for the Firehouse on Anderson Street. A balance of $275,000 remains. The grant was given by the Somerset County Cultural and Heritage Commission. In recent years no work has been done. a meeting room, should instead be a much needed storage location for the town. This would be much simpler as a meeting room would require an elevator and bathrooms. 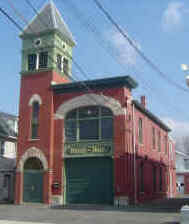 The town voted to move forward with the upgrade/repair work on the Anderson Street Firehouse. The problem of the water infiltration into the basement needs to be taken care of first. Another priority is getting a "Sprinkler System" installed. The architect needs to be re-hired. The specific work that will be done depends on the future use of the building. The fire department may or may not continue to use the building. If the fire department continues to use the building an exhaust system is necessary. then the Anderson Street Firehouse will not need an exhaust system. first floor can be used by the "Raritan Historical and Cultural Society"
for a museum to store historical artifacts and photos. Selected to receive the Historical Preservation Award by the Somerset County Cultural and Heritage Commission. The awards ceremony will be held on May 25, 2016. The "Historic Walking Tour" held last Saturday was well attended - 29 people were there. Residents who come to the Municipal Building to pay their taxes are reminded to pick up a Borough Calendar. The Damaged Shopping Center on Route 202 has at last been knocked down after two and a half years. However as of May 2nd - a lot of rubble was still there. to have come to terms with all the owners of the homes on the north side of Third Street. Thus the pending use of "Eminent Domain" will not be needed to move the project forward. Paul Giraldi (running for re-election) and Nicholas Carra. Councilman Andy Sibilia has chosen not to run again. Are still looking for candidates.